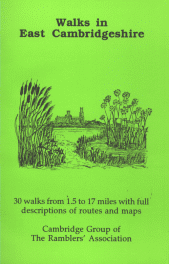 Guide to the Fen Rivers Way (published by The Fen Rivers Way Association) Describes this 80km/50 mile route from Cambridge to Ongar Hill on the Wash, north of King’s Lynn, following the Cam and Great Ouse rivers. Additionally, there are ten further walks, of distances ranging from 6.5km/4 miles to 19km/12 miles, visiting surrounding countryside. £5.00. Walks in East Cambridgeshire (ISBN 0 9522518 0 9). 30 walks from 2.5km/1.5miles to 27km/17miles, with full descriptions of routes and maps. £5.00. Walks in South Cambridgeshire (ISBN 0 9522518 3 3). 23 walks from 6.5km/4miles to 32km/20miles, with full descriptions of routes and maps. £5.00. 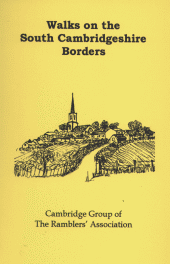 Walks on the South Cambs Borders (ISBN 0 9522518 2 5). 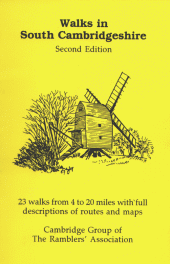 28 walks from 9.5km/6miles to 24km/15miles, with full descriptions and maps of walks on the southern borders of the county with Beds, Herts, Essex and Suffolk. £5.00. The West Anglian Way. This Guide is divided into six sections or walks that together form a 64 miles walk from Cambridge to Waltham Abbey and Cheshunt, following the rivers: Cam, Stort and Lea and linking railway stations on the Cambridge to London Liverpool Street line. £5.00. The above prices include UK postage and packaging and can be ordered from Lisa Woodburn, 140 Cherry Hinton Road, Cambridge, CB1 7AJ. Cheques payable to Cambridge Group of The Ramblers’ Association.